Effects: refreshing, rejuvenating, stimulating and balancing, antiseptic, deodorizing, antifungal, balancing sebum secretion, shrinking pores and reducing sweating, anti-cellulite. 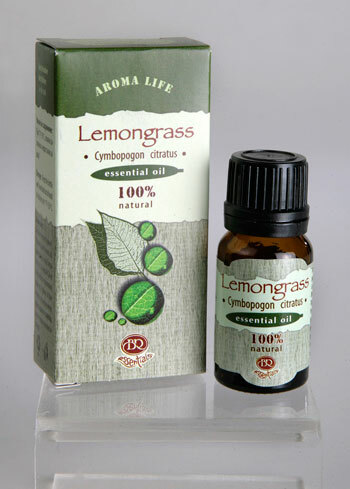 Benefits: The lemongrass essential oil has a distinctive lemon-herbal, slightly bitter fragrance. It helps for vitality restoration and raises the mood; enhances cognitive performance and promotes greater concentration on mental stress conditions; perfect for air conditioning and strengthening the senses; suitable for car air fresheners as it increases the concentration and the rate of reactions; excellent for oily, porous skin; shrinks the pores and makes them appear visibly smaller; restores skin tissue, removes skin toxins; improves skin elasticity and retains skin moisture; suitable for massage blends and compresses after overloaded training, as well as after dieting and weight loss, when the connective tissue and the skin have lost their tone; favors weight loss; favorably influences oily hair. Blends well with other citrus and floral scents, grapefruit oil, wild geranium and rosemary. Attention: Contraindicated in epileptics, hypertension, pregnant women and nursing mothers, children, persons suffering from glaucoma and people with individual intolerance to lemongrass essential oil. It is not toxic, but it can irritate the skin if not diluted enough. Phototoxic!